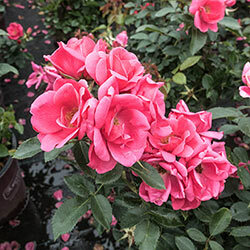 Flamingo Kolorscape Rose - Roses | Michigan Bulb Co.
Jazz up your garden borders with this distinctive shrub's vibrant, attention-getting rose blooms. From late spring to fall, clusters of hot pink, semi-double to double flowers open against the glossy, green foliage of the habit, which is compact and mounded. Garden visitors will marvel at the beauty and mildly sweet fragrance of the blooms. 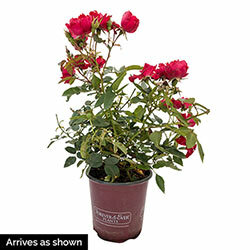 This easy-to-grow shrub reaches 2–3' in height with a spread of 2 feet. 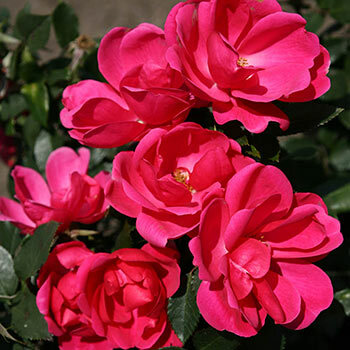 Resists black spot and performs best when planted in full sun to partial shade. Ships now, garden ready, in a gallon pot. Planting Instructions: Plant at same level as pot.